I have always loved going away to new locations to photograph, either with friends or on a workshop (where I meet new friends.....met quite a few on this last Death Valley one!). Nonetheless, when photographing 'away', there are always only a limited number of days, seasons, light conditions, and times of day in which one can photograph that location. You can never assemble a true portfolio in the same way that someone who lives nearby can. No wonder some photographers have chosen to live near iconic photo locales. I have always felt that the place to truly assemble a portfolio in which a location can be portrayed in full is near your home. Only then can you photograph in all the conditions I mentioned above. Don't get me wrong, I love travelling to photograph, but when away the simple fact is that you can only capture what is offered in a limited time span. I have previously written posts about the Rt. 528 boat ramp on Lake Arthur in Moraine State Park. More specifically, I had explained how on most mornings the scene is quite bland, but on some special mornings it just comes alive. Well, several weeks back it went and did it again....strutting its stuff and showing what it can do when the sun and clouds cooperate. For this image I used a neutral density filter to obtain an 80 second exposure, allowing the clouds and the water to blur. My webhost seems to be having trouble accepting blog comments from SOME Safari and Internet Explorer browsers. If you try to make a comment on this post and are unable to please feel free to send me the comment via my contact page and I would be glad to post it for you! My last two posts presented images that were very disparate. First, there was a segment of a mural with my mentioning that I was drawn to photographing abstract portions of wall murals and the other was a black and white waterfall. I happen to have another abstract portion of that same mural taken at the same time as well as an additional black and white waterfall image taken on the same day as the first, just located about 20 yards higher up the hillside. I thought this post, which presents both these images, would be a good wrap up summary of the last two. I was recently making photos in one of my favorite areas, a state park that is not too far from my home. 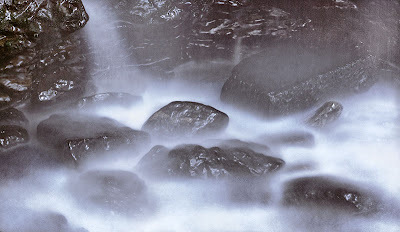 It was after a long day's rain and the water flow in the park was vigorous. I had to scramble up a hillside to get to a collection of rocks that I could see had water flowing over them. I liked the images I made on the hill, but the rocks were dark brown and muddy. So the color images just seemed to lack something and I decided to try converting them to black and white. In this particular instance, I had taken a series of HDR exposures. However, preferring a very natural look to HDR, I processed the image in my new favorite method of dealing with HDR......I imported the 32 bit TIFF back into Lightroom and processed the photo with Lightroom controls as well as a few subsequent curves in Photoshop. In this instance, I much prefer the black and white image over the color version. It is often said that before you put away your camera after photographing a scene.....turn around. Why? Because sometimes what you don't see behind you can be as good or better than what you are focusing on. At the end of September, I posted an image of sunrise over the South Shore of Lake Arthur. This picture, which is a scene 180 degrees from the sunrise shot, was taken a bit later after the fog had burned off while there was still golden morning light on the scene. Not better than the first shot, just different. About two weeks ago, I took an early morning trip to the South Shore of Lake Arthur in Moraine State Park, one of the areas I frequently go to photograph. The sunrise was simply spectacular. 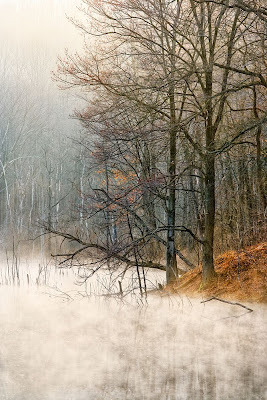 It seems like when I go to photograph sunrise in the McConnell's / Moraine State Park area I get overcast or foggy, to the point where there is no color or 'drama', about 80% of the time. Then you get one of these and it makes getting out of bed at 5AM worth it! As they say, "f8 and be there"! 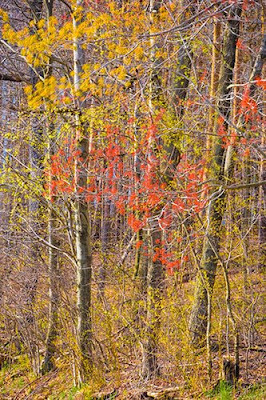 Two weekends ago I went out to do some photography in Moraine State Park. Moraine is one of several parks that are about an hour or so from Pittsburgh and which I go to frequently for photography. The creative muse was, however, not with me that day and I seemed to be driving around unable to find anything to photograph. I had turned around and started on my way back home with nothing but a few forced shots on my card when, before I exited the park, I happen to see a small side road that usually had a shut and chained gate saying "Road Closed". Today, the gate happened to be pulled wide open. Not really expecting much, I decided to turn onto the road and see what was there. From a road standpoint the answer was 'not much'. It was actually more of a long driveway to a parking circle than a road. I suspect it is usually closed because it is only meant for official park vehicles. But it did run through a field/meadow that had some amazing red grasses growing that gave the field a special feel and appearance. In the middle of the field was an isolated small tree with leaves that were already turning yellow, despite the fact that it was still August. I had noticed this tree from the main road but, because the tree was on a small hill, there was no way to photograph it without a bland grey sky as the background. From this new vantage point on the road that was usually closed, I could shoot downhill towards a backdrop of green trees, which contrasted nicely with both the yellow leaves and red grasses. I could have easily left and missed making this photo, which I particularly like. Sometimes we are given a gift at the last second....this one made the trip worthwhile! The experience made me recall what my teacher, the late Nancy Rotenberg, used to say. She would always remind us to "take whatever gift you are given". It seems fitting that her lesson came back to me on what was approximately the one year anniversary of her passing. Believe me, a lot of outings are flops from a purely photographic standpoint, but you have to keep going back because you never really know what you will find. Photographic success or not, breakfast with your friends after the shoot is always fun! "In the right light, at the right time, everything is extraordinary." This is another one of those quotes that, for me, captures the essence of photography. I was looking over some of my older images and ran across this one, which is from a time when I was experimenting with pinhole photography using film. I could be wrong, but I don't believe I have posted it before. I did enjoy photographing this way, but it became quite cumbersome to develop the film in my basement and then scan the film even before bringing the image into Photoshop. However, I became quite pleased a year or so ago when I found that I could once again do some pinhole imaging using the new LensBaby with drop in optics! With the drop in pinhole / zone plate optic one can now do pinhole and zone plate imaging digitally, without film. Some might call this heresy.....but when you have limited time you do what is practical. "The moment you take the leap of understanding to realize you are not photographing a subject but are photographing light is when you have control over the medium." Isn't it quite amazing how the same scene can look wonderful if the light is just right, but quite plain if it isn't? Daryl Benson's quote vividly reminded me of taking this photograph. This particular location can look quite amazing with mist and the right light. On this particular autumn morning the fog was just breaking up as the warm rays of sunrise started illuminating the scene. 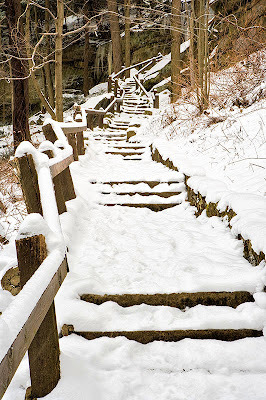 I had bever seen this location in Moraine State Park look quite like this. 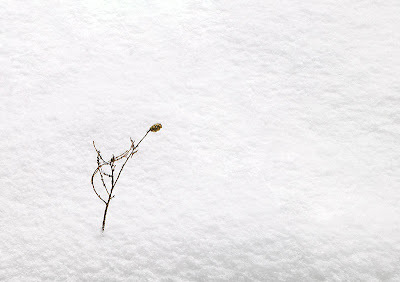 I really enjoyed photographing this as an 'intimate landscape'. However, if the light isn't right you would just walk right by and not give the spot a second look! 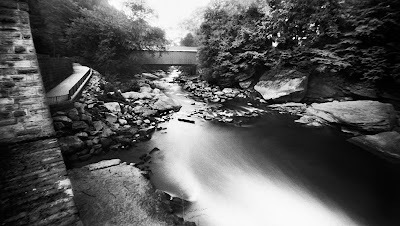 I have previously written several posts about my Twin Jewels Project, a personal project photographing McConnell's Mill and Moraine State Parks, both of which are about an hour's drive from my home. I had several periods of uncertainty during the project, but kept pushing forward. I truly appreciate the comments and encouragement that folks on this blog gave me along the way. I am pleased that the project has led to the publication of an article and photographs in Nature Photographer magazine. So, if you happen to run across the Fall issue at a bookseller....check out "The Twin Jewels of Western Pennsylvania" on pages 82-85. Interestingly, the image above, entitled "Color In Motion", is one that I had a good deal of doubts about as I had expressed in this post. To my surprise, the image was chosen as a full page photograph. I previously posted about "Foggy Morning" here. 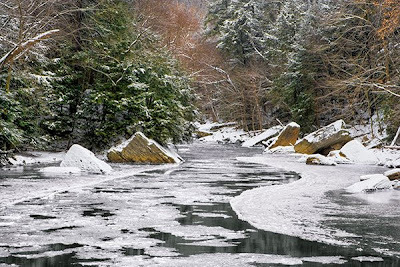 I had posted about "Icy River" here. 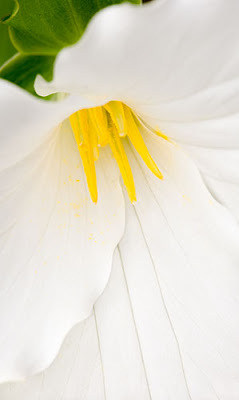 "Peeking Out", an image from my series of posts about trillium. This image of Hell's Run Falls was used as the half-page article opener and is one I almost hadn't submitted because I was uncertain about the composition (I didn't like the thin tree behind the falls) and because I thought the shutter speed was actually too slow, causing loss of definition in the thick 'strip' of water in the center of the falls. Interestingly, some of what I felt were my better images did not get chosen for the article. Anyway, I am quite pleased that after several years of photographing the parks I was able to get some portion of the project published for others to see. As I mentioned, any further ideas about how I might use the park images are welcomed and appreciated. "In cultures where language is read from left to right, images that ‘flow’ from left to right (or have an isolated subject placed on the left) are said to feel more peaceful than those which have a flow in the opposite, or right to left direction. The theory is that eye movement from right to left goes against the natural tendency for people to ‘read’ an image from left to right, thereby causing a sense of tension. In cultures where written language is read from right to left, the opposite is said to be true." Well, I have been working on an image in which I feel the exact opposite is true, and thought that it might be interesting to present it. 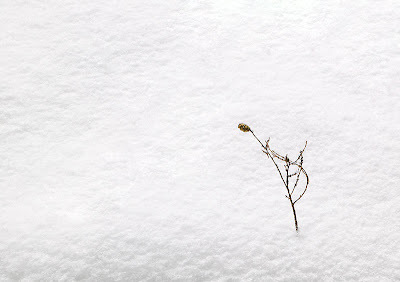 The image, which I entitled 'Surviving Winter', is of a minimalist nature, bit it seemed to express to me the idea of the brutal solitary existence needed to survive the winter season. Perhaps it is not only the placement of the grass in the frame that is playing a role here.....maybe it also has to do with the direction that the grass stalk seems to be pointing or blowing towards. Perhaps the grass 'wants' room in the frame to blow into, which it gets in the final version, instead of blowing out of the frame as it does in the initial version. Again, I am not certain why, but it seemed to me that the lower right of the frame was the best location to place the single stalk of grass, as opposed to the upper left. It makes me wonder if the supposed explanation I gave in my earlier post really 'holds water'. I often find, when starting to take photographs in a specific area, that there is one idea for an image that fairly quickly comes to mind. I may well know that there are likely better approaches to creating the image, but I don't fight that initial urge, even though I know that it is not likely to yield the best shot that I can get at a specific location. Instead, I give in to the urge and take the shot. After all, it is not as if I am using 8 x 10 inch sheet film. I consider fulfilling that initial urge akin to 'warming up'. Once I take that initial shot, which inevitably is a fairly standard view, the fun begins. I try to force myself to see the area differently. Often, the best way for me to do this is to force myself to look at things from a different perspective even though I might not have pre-visualized the photo from that viewpoint. Nonetheless, it helps to move around and actually get down...or climb up....and look through the viewfinder to see how changing perspective, position and orientation makes the scene look. I was taking some photographs of a waterfall for the Twin Jewels Project and, after taking a few of what I would call 'standard' shots, decided to try some different angles to see what I could come up with. 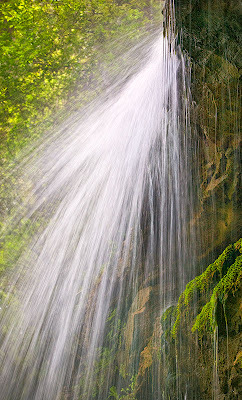 My favorite image of the falls was this one, from almost directly underneath it. I took several photos, each with different shutter speeds, but ended up liking this one, as it is different from the type of waterfall images I typically make. 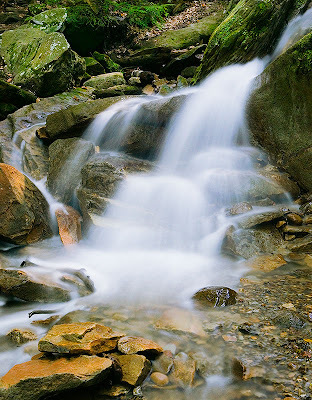 For this photograph, I chose to use an intermediate shutter speed in order to partially freeze the moving water instead of the long shutter opening I would typically use to get silky water. This final image is significantly different, both in appearance and perspective, from my original 'warming up' shot. I continue to think about (and be plagued by) the whole issue of 'greatest hit images' versus images that serve as part of a 'self-contained' project. I have posted about this before and, almost assuredly, will do so again in the future, as it continues to be a source of confusion and uncertainty for me. The issue, in brief, concerns the use of images that are related as a project in some way, as compared to what one might consider a collection of their best images. The obvious example I have in mind is my Twin Jewels Project, which I have written about before. It is a project that seems to pull me in two directions since, on the one hand, I want very much to complete and 'market' it, in terms of having it shown but, on the other hand, the images simply aren't my 'best' work because the beauty of the locale is quite subtle. If one took ten of my best shots of this particular location and mixed them in with ten of what I consider to be my best landscape images (taken around the country), I suspect that most people would be able to fairly accurately divide them into two separate piles. If one has not had many local area showings, wouldn't it be preferable to have their best work shown? On the other hand there is certainly something to be said for work from one location that is coherent and would also have local interest because the parks are nearby? See.....back and forth, back and forth, while at the same time I continue working on the project because I know it is something that I want to and should do. Let me give an example that consists of two images, the prints of which I just completed. As individual 'stand-alone' images, I don't find them particularly compelling but they do convey a feeling about the location where they were taken; at least that was my intention. I will sometimes post images on a photo review and critique forum or two, and did so with these two shots. Neither of the images received much attention or garnered any notice. Only one comment was made , and that person felt the image was mediocre. To be fair, I am not at all sure that I would have paid much attention to them as 'stand-alone' postings on a critique site either. But how do they fare as part of a larger project aimed at depicting one location or area? Should they be judged as if they were one lone picture on a wall looking for 'stardome' or judged in another fashion, as part of a greater whole and as an image of a location that will never be particularly grand by 'grand landscape' standards. How can one tell if an image is effective as part of a greater whole? I know that when reading LensWork, for example, I see portfolios that hold together extremely well but I know that I would not be excited about many of the images if viewed singly and out of context of the greater project. And how does one reconcile this with a desire to have the project shown on 'gallery walls', if you will, if they don't stand up as individual pieces of art? So, in this, more than any other posting, I really am searching for people's comments as to how to reconcile these issues. Any 'answers' to the above questions would be appreciated. 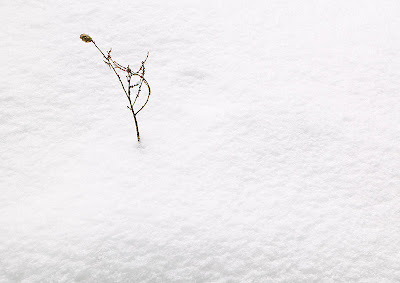 Any honest comments about how these two images relate to the answers and if they seem like they would be expressive as part of a greater project (or do they not convey any feel at all?.....I was aiming for a sense of tranquility with the first and a cold sense of endless winter with the second) would be appreciated. I think it would help me and probably also make for some worthwhile discussion. If there is an overriding presence of anything in the parks that make up my 'Twin Jewels Project', it is water. Lots of water. 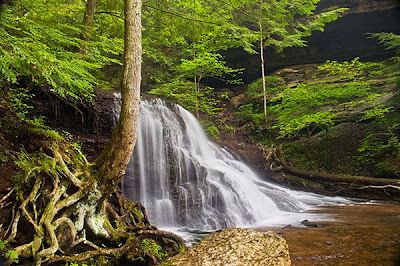 Creeks, rivers, lakes, waterfalls....you name it. Nothing on a grand scale, mind you, but one of the purposes of the project is to depict the beauty that can be found in these parks, independent of their scale and without trying to make a comparison to what can be found elsewhere. This waterfall really caught my eye. One of the nice things about photographing without anything clearly demarcating scale, is that the subject is removed from it's context. To me this has all the beauty and elegance of a twenty or thirty foot falls, even though, in reality, it is really quite small. I guess that is one part of what this project is all about....showing that there is beauty all around us that need not be on a 'grand' scale. I was feeling very bogged down and concerned that my photography was getting a bit repetitive.....and thus took a break, delving into Holga/Diana and pinhole imaging. It was time well taken. Making images with those cameras is truly an enjoyable experience, and I plan to continue photographing with them. But, most of all, it has allowed me to feel quite rejuvenated. So I am once again turning attention to my 'Twin Jewels Project'. As I think about my progress with this project, I realize that it has slowed for many reasons....and I found it useful to think about and enumerate them as part of a photographic process of 'self discovery', if it can be termed that. 1) Concern (? fear) that the images are just not good enough. Concern that I would have put in a great deal of time/effort/expense and, in the end, it would have not been a worthwhile or successful endeavor. 2) Concern that by working on making the prints for this project (it takes me a while to make a print I am happy with) I am spending time that I otherwise could use to make prints from my multitude of backlogged images from past workshops, which, as individual prints, would likely be more powerful than any single print from this project. The corollary is fear that by showing the project I might get judged by criteria which assumes that this is my best work, as opposed to my best work from this one particular location (ie, a variant of the 'project vs greatest hits' issue). 3) Concern (?fear) that, once completed, there would be no venue to show the work. 4) Revisiting work. After I have completed a print, I will frequently return to it and decide that it would look better a bit warmer toned, a bit cooler toned, a bit more/less saturated....you get the idea. 5) Desire to go back on location and improve on particular shots (shooting close to home can, I guess, be a detriment as well as a benefit). 6) Desire to shoot specific locations within the parks that I have not yet had the chance to go to. I have taken time to think these issues over, revisit some thoughts generated by reading the superb book 'Art and Fear', and have even spent some time (re)listening to some of the Brooks Jensen LensWork podcasts on the subject, which I find quite motivational. The time thus spent has been quite helpful, and I have come to some conclusions and decisions. First of all, I must produce a finished version of this project. If it ends up having no venue for presentation, so be it (though as part of the thinking process I have some ideas which I think could come to fruition in this regard). However, unless I finish it I will never know how it might have turned out and never feel comfortable, or perhaps even confident enough, to move on to the next project. Whether it is successful, of course, depends on the yardstick used for measure, and independent of it's success there is no question in my mind that the endeavor will be worthwhile. Secondly, I must 'let go' of the artwork. While my 'revisitation' of the images and the improvements that I might make to them could well prove beneficial to any one given image, they are clearly, by significantly impeding progress, detrimental to the project as a whole . Once I consider an image finished, it is not to be revisited until all the images are completed and efforts are being made to obtain a venue to show them. Thirdly, I will not go back to purposefully reshoot images that have already been made, though it seems reasonable to try to capture them in a different season etc. There are also one or two more locations that I would like to try to capture. Finally, I will need to give up at least some of the time that I would spend out photographing in order to work on the prints. I have some ideas for different projects, but will not even think about working on those images until this project is complete. I am, however, going on a workshop to the Smokies in October and will take a break for that. As a result, I have taken the bull by the horn, so to speak. I have, literally, close to a thousand images from the parks (granted some of them are bracketing, different focus and apertures etc...I tend to take a lot of images from one spot) and, prior to this, had been picking out images for printing one at a time. Since my last post, I have gathered them all together in Lightroom and 'brutally' edited them down to probably 60 or so that I think might be included. Are they all wonderful stand alone images....no, but I think they do nicely depict the personality of these parks as part of a themed project. I probably have 10 or so completed previously and would like to end up with 40-45 images in the project. I have started to work on them in earnest. In the coming days/weeks I will post other images that I have completed or am completing as part of the project. I am also giving thought to an "Artist's Statement" to help pull it all together. It turns out to have been quite helpful to really sit down and be brutally honest with myself about where I am going with this and how it is progressing. There are probably multiple times throughout everyone's artistic career that a session like this can be helpful!